GCA Altium acted as financial adviser to HgCapital on the sale of Personal & Informatik AG (“P&I”), Germany's largest vendor of payroll and strategic HR software, to Permira, a global investment firm. P&I is one of the most important and renowned companies in the HR industry in Europe. P&I has positioned itself as an HR cloud company with innovative software for all HR tasks. Over the course of four decades, P&I products have been enriched with information from the highly diverse tasks and best practices of its more than 15,000 customers and systematically developed further. Today, P&I offers the technically most advanced HR software in the market with the most comprehensive range of specialist HR task options for Payroll, Human Capital Management and Analytics. In the financial year 2015/16, P&I generated revenues of € 117.5 million and EBITDA of € 49.3 million. HgCapital initially invested in P&I in December 2013 which represented the first investment from the HgCapital 7 Fund. GCA Altium advised HgCapital on this acquisition and assisted in raising acquisition financing. 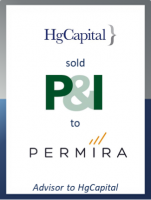 The sale of P&I to Permira is the first exit from HgCapital 7 and is one of the largest software buyouts in Germany ever. HgCapital has retained a minority position in P&I.